Butterfly-Crafts has a new website! It has been a very long time coming but I am very pleased, and very proud to be able to launch the new website for Butterfly-Crafts! Here you can see a screen shot of the home page, it's quite purple in line with my branding! 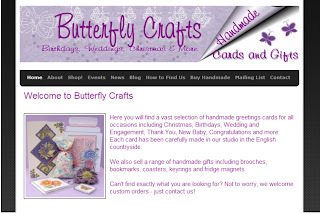 As much as I love my Artfire shop, I have wanted a central website that showcases my handmade cards and gifts but also has pages for events I am attending, news items, the websites I sell on, links to social media, a facility to sign up for the Butterfly-Crafts newsletter and also a page with links to 12 other handmade sellers. I am really happy with the website, it was not too complicated to set up, unlike transferring the domain host over! I hope that it creates a more professional look than the previous website I had created and that it can only go towards helping Butterfly-Crafts succeed!